Two monster sized local hits powered the box office in late January and early February. Leading the pack was the comic drama Miracle in Cell No. 7, which took 4.6 million admissions in two weeks on the back of strong word-of-mouth. This is the equivalent of more than US$30 million, and the film is continuing to do well as it heads into its third week. Distributed by N.E.W., the work tells the story of a man with the mental capabilities of a six-year-old who is put into a prison cell together with a group of notoriously tough criminals. Eventually, they work together to try to reunite the man and his young daughter. RYU Seung-ryong, who enjoyed success in the 2012 comedy All about My Wife, plays the lead character of Yong-gu, together with an ensemble cast of experienced actors. It is directed by LEE Hwan-kyung, whose three previous films He Was Cool (2004), Lump of Sugar (2006), and Champ (2011) enjoyed variable success, but nothing on the level of this new film. Meanwhile, a new action blockbuster by the well-known director RYOO Seung-wan bowed on January 30th, and enjoyed a very strong opening. The Berlin File, shot on location in Europe and featuring an all-star cast, rocketed to 2.8 million admissions (US$19 million) in just over a week. It has placed slightly ahead of Miracle in Cell No. 7 in daily box office tallies, though both films have continued to hold up well since their release. Distributed and financed by CJ E&M, The Berlin File represents the most expensive and commercially ambitious feature to date for the talented RYOO. It is also already the highest grossing work among the director’s eight previously released features, surpassing the score of his 2010 film The Unjust (2.77 million admissions) and the 2004 feature Arahan (2.05 million admissions). The film tells the story of a North Korean spy (HA Jung-woo) and his wife (JUN Ji-hyun) who get caught up in a web of intrigue involving the Pyongyang-based RYOO Seung-bum and a South Korean agent played by HAN Suk-kyu. Although it is now starting to fade in the wake of competition from the above two films, gangster comedy Man on the Edge added an additional 976,143 admissions over the two-week period to bring its overall total to a very impressive 3.9 million admissions. The film by JO Jin-kyu (My Wife Is a Gangster) stars PARK Shin-yang, KIM Jung-tae, UHM Ji-won and JEONG Hye-young in a story about a gangster who, through a series of misadventures, ends up pursuing a clandestine second career as a shaman. 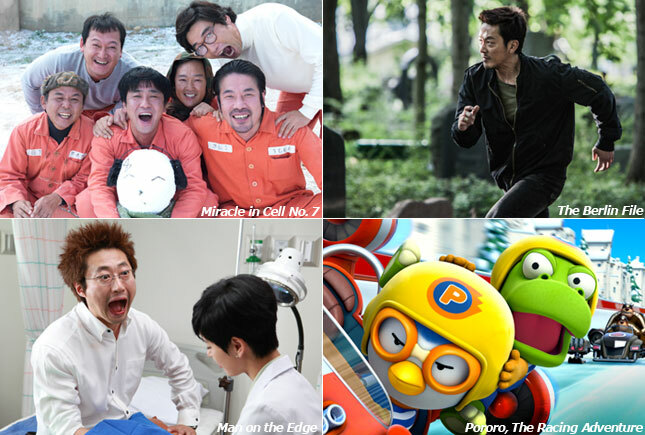 The #4 slot is taken up by a Korean film of a very different type, the children’s animated feature Pororo, The Racing Adventure. This marks the first theatrical feature film made out of the phenomenally successful children’s TV series Pororo, which has been sold around the world and which also earns large amounts of revenue through character branding and merchandise. With almost 700,000 admissions to date, it marks another recent success for Korea’s animation sector. Imported films round out the #5-#10 slots, with Hotel Transylvania adding a further 378,478 admissions to bring its overall total to 876,033 in three weeks. Hollywood musical Les Miserables, released back on December 19, continued to make its presence felt with a further 371,308 admissions to bring its overall total to 5.8 million tickets. Also showing considerable staying power was Ang LEE’s Life of Pi, which since being released on January 1st has taken a total of 1,562,520 admissions.